Has the Diaspora failed? Can more be done? There is a spirited debate going on, at least in the United States, as to whether Diaspora Ukrainian trade, academic and professional organizations have maximized opportunities to share information with the greater public about the political, economic and historic relationship between Kyiv and Moscow. It's undeniable that the average radio listener, television viewer, or newspaper reader who may be getting their first real glimpse into the Ukrainian soul is receiving it through a filtered Russian perspective. Ukraine is often portrayed as an appendage of greater Russia. Sometimes it almost appears that this ancient land is little better than a break away region. Many Western scholars are offering a Russified view of the events now unfolding in Eastern Europe. This stems in part from the modest media and communications infrastructure at many Ukrainian organizations to reach a non-Ukrainian audience. Telling other Ukrainians about their history doesn't achieve much. There has been much positive news about Ukraine. Rallies by ordinary Diaspora Ukrainians has helped to generate much media coverage in the West. But that image is not always accompanied by a coherent, consistent and ongoing message. Pictures are great, but what's the point if there's no lasting message. This is where Diaspora organizations are critical. One of the most important strategies I've used in print and radio interviews why Americans should care about Ukraine stems from its own security. Ukraine is the second largest and potentially one of the richest nations in Europe. It is not in America's national security to see Russia exploit such a resource. Once that case is made, fellow citizens who would not normally care about a situation far removed from their families begin to listen. The Ukrainian cause must be made into their cause. Think about the expression, "politics makes for strange bedfellows." Alliances are frequently formed by disparate groups because they agree on a common goal, but for different reasons. Diaspora Ukrainians want a free Ukraine for one reason and non-Ukrainians for another. Don't think that Poland or Lithuania was first in line to protest Russian interference because they were concerned about Ukrainian liberty. They did it out of pure self-interest. Once Ukraine was back under Moscow's thumb they could be next. In the case of America, for example, journalists and commentators have a greater interest if they think that the United States could be threatened in the long-term. The message must be tailored to each specific audience. No one will care about Ukraine unless they may be threatened in the future. Because Diaspora Ukrainians think its important doesn't mean our neighbors or local elected officials will subscribe to the same views. Can create a "name brand" for Ukraine in a manner that is of interest to non-Ukrainians. What should non-Ukrainians identify about the country? Why should they care? Create media lists with tailored editorials and press releases about events in Ukraine. Is there a local spin? Is there a spin as it relates to a particular state, province or country? Communication departments must have the media savvy to offer rapid response. If an "expert" on American Public Broadcasting Service (PBS) or in the New York Times offers a Russified perspective on events then their should be a press release issued to national media. Set up teams of professionals to meet with editorial boards at major newspapers to help guide their editorial pages toward offering a Ukrainian perspective without the filter of 300 years of Russian exploitation. Press kits must be sent regularly to reporters, managing editors, religion editors and international editors highlighting Ukrainian experts available for interviews. This applies to radio and television producers as well. If a Diaspora Ukrainian organization has not already sent out press kits that include something as basic as rolodex cards with an expert's name that a journalist may call when he or she needs a sound bite then a change of leadership is merited. This is Communications 101. Just because you send press kits or press releases doesn't mean you'll get called. There needs to be telephone follow-up. Remember, the issue or story may be important to you, but there are other news worthy events in the world. Most things have to be sold and marketed. Don't be romantic about the merits of your story. In light of how much information Diaspora Ukrainians have access to stemming from friends, family or professional colleagues in the ancestral Motherland, there is no reason that regular interaction with journalists can't be occurring. Journalists love a good tip. Keep them satisfied. Building a communications infrastructure is an ongoing process. Once you establish a relationship, for example, with a key reporter at a major newspaper you nurture it. The interaction should not end once things simmer down in Ukraine. It will take decades to educate the media and general public about the distinctions between Ukraine and Russia. Russia is not going away. It will always try to assert some level of control over Ukraine. With that in mind Diaspora Ukrainian organizations must establish the means to get out a sustained, coherent message. Otherwise all is for naught. Do not forget that most Revolutions begin by the dissemination of information. Dictators hold onto power by controlling the media. The person or organization that controls the message and is able to be heard wins. It's that simple. Disapora Ukrainian organizations also need to hold workshops for their own constituencies that educate them on how to approach lawmakers or write letters to the editor, among many other things. Once you've decided on a message you need both the experienced professionals and the resources to support them. Hire the best and keep them happy. In summary, Diaspora Ukrainian organizations must remember it's all about message, continuity and pragmatic strategic planning. It doesn't matter how noble one's cause or the brilliance of an idea. If you can't communicate their importance to a wide audience then it's just as well they didn't exist. Diaspora organizations need to be less romantic and a lot more Machiavellian. 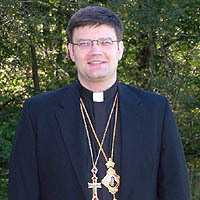 Bishop Paul Peter Jesep is the Vicar General and Chancellor of the Archeparchy for the Ukrainian Autocephalous Orthodox Church of North and South America Sobornopravna. His Grace, a lawyer and political scientist by training, is a former legislative analyst to U.S. Senator Susan Collins (R-ME). He has served as a Communications Director for several state and region wide organizations in the Northeast. He has also studied at Bangor Theological Seminary (bts.org), the third oldest such school in the United States. His Grace may be reached at VladykaPaulPeter(a)aol.com. The views expressed here are strictly personal.